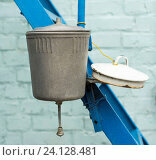 №24128481 1 Rural washbasin. For your commercial and editorial use. №13741664 1 Drama students use a tape measure to plan stage space for sets in a school play in San Clemente, CA. Note girl's aquamarine dyed hair.